A project of the School of Geological Sciences and Engineering investigates the Imbabura and the Cubilche volcanoes. After collecting several samples at the Imbabura-Cubilche volcanic complex (ICVC), Kewrin Choez, an eight-semester student at the School of Geological Sciences and Engineering, and Elisa Piispa, a professor at the same School, traveled to Michigan Technological University (MTU) in the United States to perform paleomagnetic and rock magnetic analysis that will reveal important information of the history of both volcanoes. Elisa and Kewrin together with three other faculty members and five students are part of the “Taita Imbabura” research project initiated by former Professor Patricia Larrea. She won one of the Yachay Tech University internal grants: Seeds of Innovation. 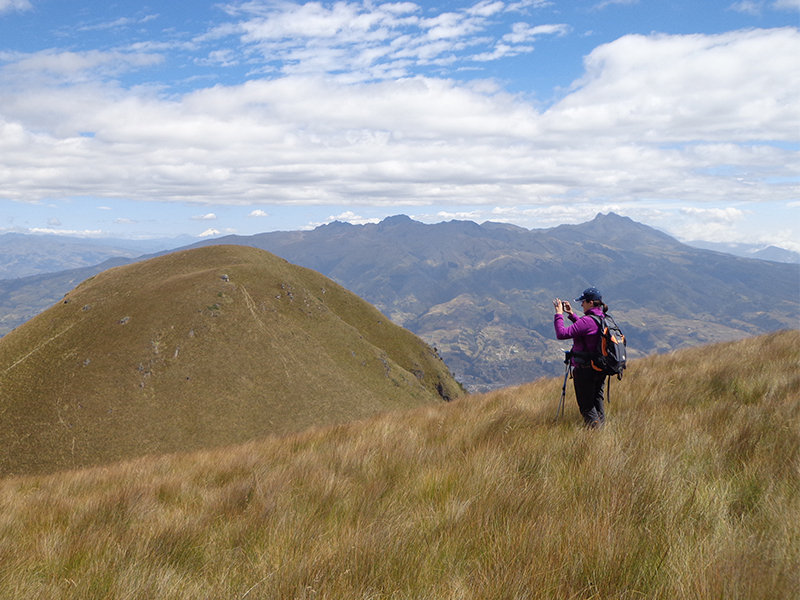 The aim of the project is to decipher the spatio-temporal evolution of Imbabura and Cubilche volcanoes. The characteristics of the lava deposits of both volcanoes and their relationship with the city of Ibarra will be examined. Professor Aleksey Smirnov, who welcomed the two representatives of Yachay Tech in his laboratory in MTU, is one of the Co-PIs of the project. The “Taita Imbabura” project consists of two parts. The geochemical investigation is led by Patricia and the geophysical part of the project is directed by Elisa. Kewrin, is the current PI of the project. The surrounding area of ICVC consists of different lavas, pyroclastic flow and debris avalanche deposits which origin is not well constrained. In fact, the basin in which Ibarra is located is surrounded by at least seven volcanoes that erupted and collapsed nearly at the same time during the Quaternary. The main aim of the geochemical part is to reconstruct the evolution of Imbabura and Cubilche. Geochemical analyses of the samples will make it possible to infer magmatic processes involved in the formation of the edifices, the main portion of a volcano built by deposits of material after eruptions. Their research team is conducting an investigation on the debris avalanche deposit underlying the city of Ibarra. The preliminary results show that Cubilche is likely the source of that deposit. In addition, the team made a digitized model rebuilding the original edifice of Cubilche, which showed that the volcano used to be much larger. The team named this model “Cubilchón”. Although volcanic activity is very low in the area, their research will help understand the historical evolution of the volcanoes, thus improving volcanic hazard assessment for the future. The primary aim of the rock magnetic and paleomagnetic research is to cross-correlate lavas, mass flow deposits, dome sectors and pyroclastic flows, thereby improving the relative chronology of the events. Furthermore, the paleomagnetism provides important information about the Earth’s magnetic field direction and strength recorded by cooling volcanic deposits. For this, the team needs to date the lava samples in order to know how the Earth’s magnetic field has changed in the area. The Earth’s magnetic field varies in timescales from million years to milliseconds. The most dramatic event the Earth’s magnetic field can experience is a reversal, when the magnetic north pole becomes south and vice versa. This occurs an average of about five times in a million years, but the last known reversal was 780 000 years ago. So there’s a possibility that the Earth is due for another one. The Earth’s magnetic field has been weakening the last 200 years, which has been observed in the past to be a potential sign of an incoming reversal. In order to understand the behavior of the Earth’s magnetic field it is important to have information on its strength and morphology in the past. In order to understand the present and potentially even the future we need to study the past. A decrease in the Earth’s magnetic field already now poses a threat to telecommunications systems that we use. The satellites are vulnerable to the high energy particles coming from the Sun without the shielded effect of the magnetic field. This project, in its entirety, is highly interdisciplinary and hopes to contribute much in the training of students of the School of Geological Sciences. For Kewrin, one of the most valuable lessons is to have been part of the process of building a research project starting from scientific curiosity to all the way to its materialization. Additionally the project has been a great opportunity to apply the knowledge acquired in class and to learn how to use various geological and geophysical equipment. The research project allows the students to learn about many areas of Geology in a practical way. Professors Matteo Roverato and Elisa Piispa, former professors Patricia Larrea and Luke Bowman, and students Gustavo Bejar, Kewrin Choez, Jonathan Gordillo, Romina Bermeo, María Emilia Iglesias and Daniel Miranda all took part in the conceptualization and initial development of the project.